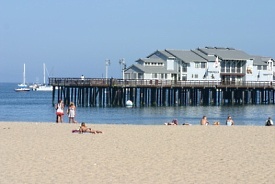 Santa Barbara is surrounded by palm-lined Pacific beaches and the Santa Ynez Mountains. Nicknamed the "American Riviera," Santa Barbara is perfect for sunbathing on white-sand beaches, window-shopping along the village's pristine, historic streets and relaxing in one of the many cafes. On Sunday make sure to stop by the weekly Waterfront Arts and Crafts Show, one of the city's best-loved traditions.